Harrison Gibson Fire - a Memory of Ilford. I remember the H-G fire well. I was sixteen at the time and was on my way home from evening classes at the South West Essex Tech, as it was called in those days, in Longbridge Road Barking. As soon as I left the college on my bike I noticed the glow in the sky and knew it was somewhere near where we were living at the time in Sunnyside Rd. I always rode down Dawlish Drive and by the time I reached South Park Drive, you could see and smell the smoke and the roads were becoming very busy. 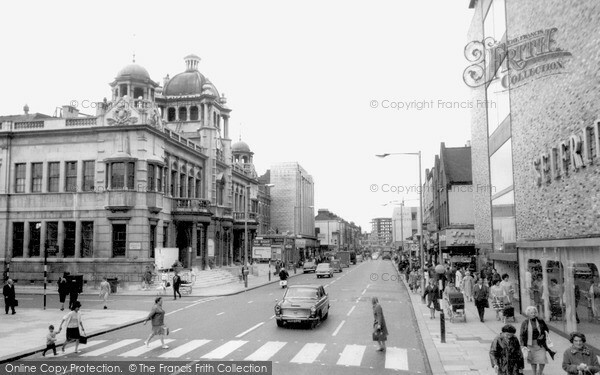 Whilst watching what was going on I bumped into my father who was a policeman based at Ilford nick, he had been called in because of the emergency to help direct the traffic. Most of the surrounding streets were clogged with vehicles and buses were being turned around at the wide part of Romford Rd near Little Ilford Lane and the Guinness bottling plant. The other way they were being turned near The Cauliflower pub, towards Seven Kings. Because the power was down, trolley-buses were being pushed away by the passengers. As the railway ran just behind the store the trains were being stopped at Forest Gate & Manor Park one way, and Seven Kings and Goodmayes the other. Someone has stated on this site that the other shop to get damaged was Selfridges, it may have become that later but at the time it was called Moultons. I have read that the guy who locked up at the end of the days business smelt petrol, and he may well have, as my father later told me that less than 48 hours after the fire he had seen drawings of the new store. Draw your own conclusions. I remember the fire too! As a child I was living in Victoria Road, just off of Ilford Lane at the time, and I can remember everyone being out in the back gardens watching the glow in the sky as H&G burnt. I also remember the United Dairies bottling plant in Ilford High Rd, and used to be fascinated to watch the bottles going along a conveyor belt! I also remember that fire as I was cycling home to Woodford Bridge after spending time with my cousin whose parents owned Garwoods fish shop on the corner of Ley Street. I lived in The Drive. I remember rushing down to Ilford when the fire was destroying Harrison Gibson. I couldn't believe the size of the Inferno. All trains that used to pass behind the site were cancelled. I believe that after H G was rebuilt there was a nightclub built at the top of the building. I went there once, too expensive for me had to stick to Ilford Palais where I met my wife, 2 shillings (10p) and half a crown on Thursday. Those were the days. Add a memory of Ilford.